Read on to find out why pet photography is the genre sure to take you to the next level. 1) Do you love pets and would you enjoy working with them (even if they are misbehaving)? 2) Do you respect the craft that is professional pet photography and professional photography in general? If you’re looking to make money it’s wise to follow the money; go where the money is, where the trends say it will continue to be, and, more importantly, where people are willing to spend it. So, how can you apply this to professional photography? Well, the question then becomes: which photography genre best fits these criteria? That’s right, believe it or not, pet photography is the genre that best fits this bill. Don’t believe me? According to the American Pet Products Association and their annual industry-wide spending figures, 2017 broke [industry] records with a whopping $69.51 BILLION accrued! Woof. Clearly, there is money in the industry, and, with that cool $69 bill being a 4.1% - $2.76 billion – increase over 2016’s numbers, it shows that the market is growing and that pet owners are willing to spend. Continuing this train of thought of going where the money is, and to add some perspective, the wedding industry as a whole drew in $72 billion in 2016 – according to IBIS. However, the crucial factor is while all signs point to a shrinking wedding industry, the pet industry is expected to continue its steady growth. Just to be clear, according to CDC/NCHS National Vital Statistics the rate of marriage is declining; down to 6.9 per 1,000 in 2016 from 8.2 per 1,000 in 2001. Furthermore, more Americans are choosing to remain single than ever before, according to a study conducted by Pew Research. No marriage means no wedding; which means no wedding photos and expensive albums; and all this spells disaster for professional wedding photographers. 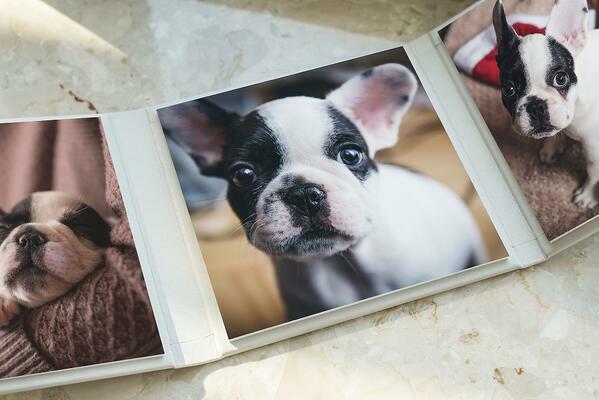 A pensive dog ponders the future in our Exclusive Complete Album Set with textiles A30 + A37. 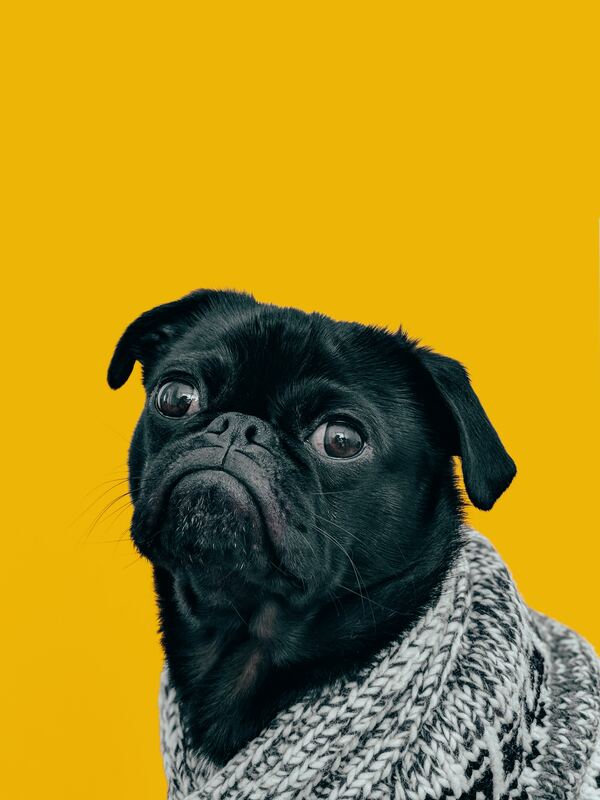 On the other hand, the APPA estimates that between 2015-2016 approximately 65% of US households (79.7 million) own pets, with 46% percent of homes having more than one, AND the numbers are expected to continue to rise. For the record, as a whole the pet industry is predicated to grow by close to 4% from 2017 to 2018 (still waiting on official 2018 numbers). It’s expected revenue? Perhaps an ironic - $72 billion. Bottom line: the pet industry is a healthy, stable, and growing field. It’s comparable to – if not now larger than – the wedding industry; and if the wedding industry can, and traditionally certainly has, provide a good living for a professional photographer, why can’t the same be true for the pet industry and pet photography? But this actual $69 billion and projected $72 billion doesn’t come from nowhere. Instead, it comes from a cohort that is willing to put money forth. According to a study by the Bureau of Labor Statistics, Americans spent an average of just over $502 on their pets in 2011. Remarkably, that’s more than money spent on men and boys clothing ($404), landline phone bills ($381), and even alcohol ($456) in the same year. Spending didn’t even slow day during the recession – which, obviously affected most other expenses and industries. A pup's life portrayed in our Triplex - 7X7; C16 leatherette. So we now know why pet owners are willing to put forth so much for their faithful companions – they are viewed not as ‘just pets’; but family. More akin to a sibling or a child. This embracing of pets and full-on emotional commitment is authentic and certainly not going to change anytime soon. What was once considered pet pampering is now the new base standard. Indeed, when viewing the breakdown of pet expanses for 2017, provided in the APPA Spending Figures report, you’ll find a category for ‘Other Services’. This includes extras such as training, grooming, boarding, walking, and more; and it accounted for $6.16 billion of the overall expenses with a huge 6.9% increase from the previous year. Luxury pet life is real; and growing. The areas pet owners will explore to benefit or show off their pet are only limited to the imagination. 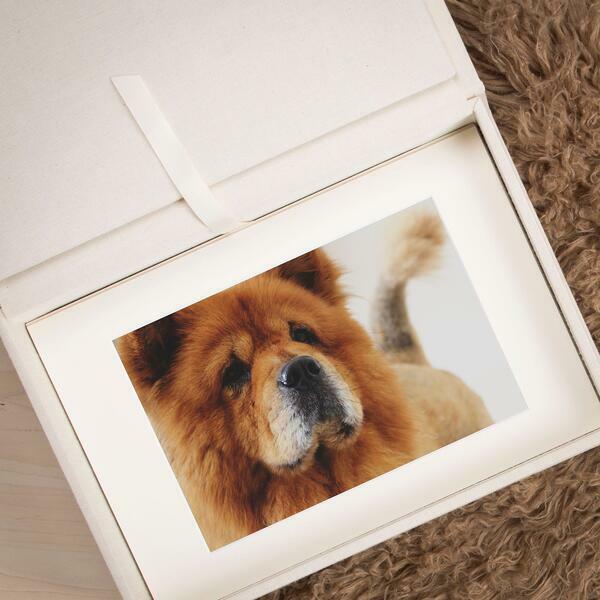 A beautiful dog portrait featured in our Folio Box 8x12; textile A31. All this makes for a ripe market; the ideal setting, for any business really, and certainly for professional photographers. Of course, to state again, the most important thing in deciding to be a pet photographer is the love for the pets and the love of the craft, but if fear of the market and the financial situation is what’s holding you back, fear no longer. Consider this, the wedding is generally always viewed as one of the most significant moments of a person's life. Well, as quoted above – and as the statistics prove, a pet is a significant part of its owners life as well. In fact, I’ll bring it home, I argue (and the statistics seem to prove) a pet is at least on par in significance with a wedding, if not (especially in the case with the latest generation coming of age) more important. The wedding industry has lone given rise to near celebrity-level photographers who are able to live comfortably - focusing solely on the one genre; why not the pet industry as well? The numbers certainly show for it to be possible. Fame for pets? Why not? Two 'fat cats' in a stare in our Creative DreamBook 4K. The truth is the wedding industry is trending downward while pet ownership and pet spending are going up (and up). Not even the recession was enough to slow down pet owners willingness to spend. Also, bear in mind the industry expects not only spending habits to increase over the years, but also pet ownership itself. Truly, a growing market. 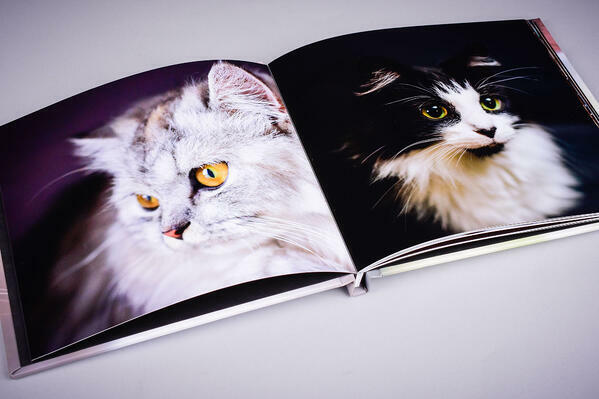 Twenty to thirty years ago it would have been crazy to suggest a couple would choose a pet album over a wedding album, but today the trends suggest it will soon be reality – and a sustained one. If you love pets and love taking pictures, you’d be remiss not to open shop and dip your toe in this lucrative market and, yet, relatively uninhabited genre of photography. 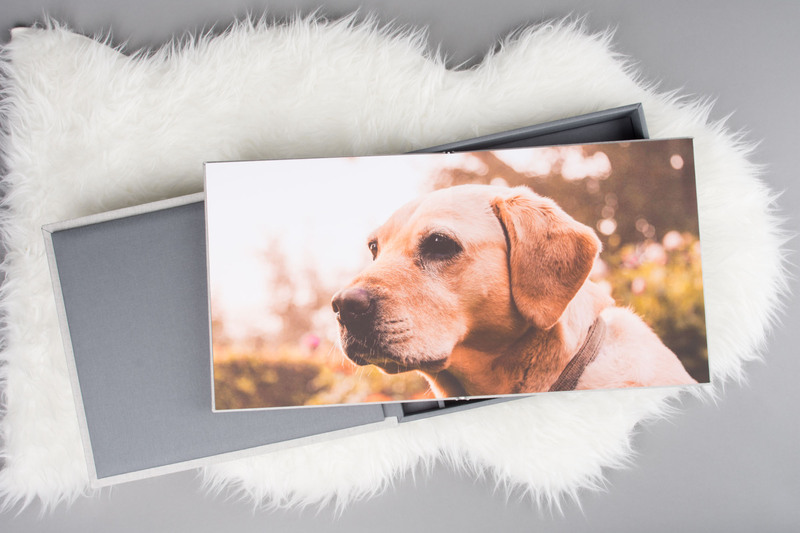 Now that we’ve got you thinking about pet photography; check out The 4 Best Print Products for Pet Photography to know exactly what to offer your clients.